Another Real Example of Stupidity.... the Abusive Leader!!!! 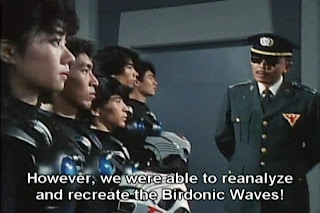 Meet the Neidermeyer, Commander Ichijou from Jetman and in real life, there are some people who are like he is. If you think such people just exist in fiction, they do in real life and not only in the military. They are classified as having no sense of direction, think they are always right, they call other people stupid (and that's the evidence of the latter) and they sometimes play favoritism with their employees. All these cause low morale and if everybody is stupid except him then entrusting responsibility to STUPID PEOPLE makes this person ever MORE STUPID! So in a sense, if one thinks they are smarter than everybody else then delegation of responsibilities is NO LONGER a smart decision on his/her part. Yeah right, Serpentor thinks he's too smart... actually such people DO EXIST when it comes to personality!